After steamrolling BJ Penn at UFC 137, Diaz questioned the legitimacy behind the injury that forced St-Pierre out of their fight that night. 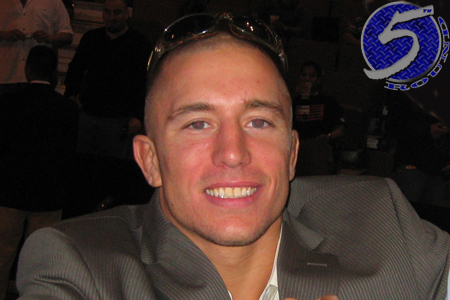 GSP was sitting front and center listening to Diaz’s in-Octagon call out. Minutes later at the post-fight press conference, White said the “St-Pierre flipped out” line that’s been running in all the UFC 158 promos. Well, it appears that was only just the beginning of Diaz’s verbal assault on the reigning welterweight champion. “There’s more to this story that hasn’t been told,” White stated on the radio show. “Nobody has talked about this, I haven’t said anything about it, but at one of the fights, the one where he really starts calling Georges out, he was chasing Georges around the hotel and like yelling at him and stuff. And Georges thought that he was going to try to fight him at the hotel. He was just waiting for the elevator doors to open and see Nick Diaz. Ironically, it was Diaz who kept claiming St-Pierre was “out of line” during last week’s instant classic conference call. When asked if he thought they were going to throw down in the hotel, White believes their beef would never have come to that kind of barbaric behavior. However, he does think that’s the root behind St-Pierre’s never-before-seen ire. “I don’t think that would ever happen, but Georges St-Pierre felt like it was and that bothered him,” White said of the bitter rivals fighting in the lobby. “Georges St-Pierre has said publicly many times that when he was younger, he used to get bullied and that’s what got him into martial arts. St-Pierre and Diaz get to settle their differences this Saturday at UFC 158.